UNITED NATIONS — Russia again vetoed a U.N. resolution Friday that would extend the mandate of the expert body charged with determining responsibility for chemical weapons attacks in Syria, dooming its operation and making it exceedingly difficult to hold anyone accountable for the deaths of hundreds of civilian victims. It was Russia's second veto in 24 hours of a resolution to keep the Joint Investigative Mechanism, or JIM, in operation. And it was Russia's 11th veto of a Security Council resolution dealing with Syria, its close ally. Russia cast its latest veto Friday night on a last-ditch resolution by Japan to extend the mandate for 30 days for further discussions. It was supported by 12 of the 15 council members with Bolivia joining Russia in voting "no" and China abstaining. The first Russian veto on a U.S.-sponsored resolution, and Russia's failure to get the minimum nine "yes" votes on its rival resolution during a highly contentious three-hour council meeting Thursday, reflected the deterioration of U.S.-Russian relations. At the heart of the dispute is the demand by Russia for major changes in the way the JIM operates, and the United States' insistence that the current mandate be extended and the JIM's independence be preserved. U.S. Ambassador Nikki Haley told the council after the vote the veto "shows us that Russia has no interest in finding common ground with the rest of this council to save the JIM." "Russia will not agree to any mechanism that might shine a spotlight on the use of chemical weapons by its ally, the Syrian regime," she said. "It's as simple and sinful as that." White House press secretary Sarah Huckabee Sanders said that by vetoing the JIM's renewal "Russia has sent a clear message that it does not value the lives of the victims of chemical weapons attacks." Russia's U.N. Ambassador Vassily Nebenzia shot back that the JIM for two years "has rubber-stamped baseless accusations against Syria," stressing that the failure to eradicate its "fundamental flaws" brought about its downfall. He said Thursday's heated council meeting "left behind a very unpleasant sludge, and it focused on political content which is far from the issue of Syrian chemical weapons." "What is taking place here is akin to a bad theater production," Nebenzia said. "Russia is being accused of having shut down the JIM" by the U.S. and its supporters. He said they are really responsible for shutting the JIM down by refusing to support the Russian resolution on Thursday. It remains on the table, Nebenzia said, but any extension of the JIM's mandate is only possible if its flaws are fixed and it is made "stronger and more robust." The JIM is a joint investigative body of the U.N. and the international chemical weapons watchdog, the Organization for the Prohibition of Chemical Weapons or OPCW. The Japanese draft asked Secretary-General Antonio Guterres and the head of the OPCW to submit proposals for the structure and working methods of the JIM within 20 days. It said the proposals should reflect the views of Security Council members. 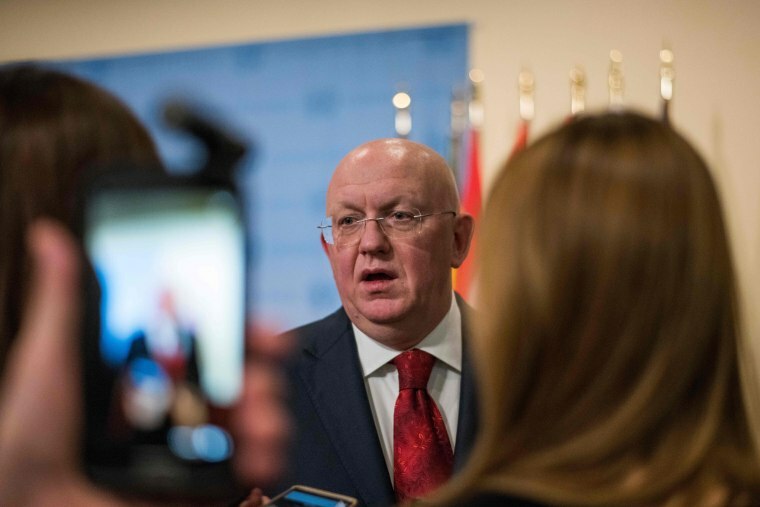 Nebenzia said the draft placed "a completely impossible challenge" for the secretary-general because Thursday's heated council meeting demonstrated that council members on many issues "are diametrically opposed." The day began with closed council discussions on the Japanese draft where Russia's deputy U.N. ambassador Vladimir Safronkov opposed the measure while Haley and many other council members supported it, according to council diplomats speaking on condition of anonymity because the meeting was private. The JIM has also accused the Islamic State extremist group of using mustard gas in 2015 and again in September 2016 in Um Hosh in Aleppo. Syria has denied any use of chemical weapons, while Russia has accused the JIM of using faulty methods to determine that President Bashar Assad's government was to blame for the attacks, including not visiting Khan Sheikhoun. Nebenzia said the JIM's leadership "disgraced itself with a fictitious investigation into the episode of sarin use in Khan Sheikhoun." After Friday's vote, Sweden's U.N. Ambassador Olof Skoog asked for new Security Council consultations to see if there was any way of salvaging the JIM. Italy's U.N. Ambassador Sebastiano Cardi, the council president, emerged about an hour later telling reporters: "We will continue to work in the coming hours and days constructively to find a common position in light ... of this crucial nonproliferation issue." France's U.N. Ambassador Francois Delattre called the vote "disastrous," saying council members can't "throw in the towel" because the Russian veto poses "a major threat to the security of us all." He said it is liable to weaken international efforts to prevent the use of chemical weapons, to be a green light for some to use chemical weapons because there is no way to ensure accountability, and to create a "fertile breeding ground for chemical terrorism which is something we are all gravely concerned about." Britain's U.N. Ambassador Matthew Rycroft told the council: "We will keep going, not only to bring justice to those who have suffered from the use of these despicable weapons, but also to deter those who might think of doing so in the future."